Apollo 10 is an often overlooked footnote in the public memory of the moon landings, but as a full dress rehearsal for the landings proper it deserves every plaudit allowed. Without this mission, Apollo 11 would not have landed. If Apollo 8 whetted the appetite of the general public for space in general and pictures of the Earth in particular, it seems to have motivated the astronauts even more. As a result, Apollo 10 contains possibly more images of Earth than any other mission, and transmitted colour TV pictures from space for the first time in a number of live broadcasts. This document identifies the CSM-LM docking sequence as the first ever colour TV broadcast from space. Most of the TV footage is of inside the capsule rather than Earth (much to the evident frustration of CBS host Walter Cronkite, who fronted the live coverage of the mission on TV) and of the lunar surface, but there are some shots of Earth. The mission launched on May 18th 1969 at 16:49 GMT, reached the moon on the 22nd, set off back to Earth on the 24th and landed back on Earth on the 26th. The timeline for the mission can be found here: Apollo 10 timeline. In total 1463 images were taken over 9 magazines, but most of the Earth images are concentrated on magazines 27, 34 and 45. Few of the images of Earth are available automatically in high resolution format. As a result, the Apollo Image Atlas (AIA) was used to browse for images, and the Gateway to Astronaut Photography of Earth (GAP) search & image request facility was used to obtain higher quality jpgs. The search facility is freely available to anyone. In addition to the photographs, 15 magazines of 16mm films were taken, and these can be viewed at the AFJ DAC video library. These films, taken with the Data Acquisition Camera, show the Earthrise movies as we have come to know them. The TV coverage at the time could not show Earthrise live, as the TV signal could not be transmitted to Earth until after acquisition of signal, ie until the ground based receiving stations were fully visible from the spacecraft as it rounded the far side of the moon. Three satellite sets are available here: ATS-3, ESSA 9 and NIMBUS 3. The full ATS-3 document (including technical details of its operation) is here: ATS-3 document source , the full ESSA document is available here: ESSA-9 document source and the full NIMBUS documents can be found here: NIMBUS-3 document source 1 and here: NIMBUS-3 document source 2. The former shows the relevant orbits joined so that a day's images are presented on a single page, while the latter are the unedited film sets. A recent addition to the NIMBUS archive is from the NIMBUS data recovery project here. The project is recovering the IDCS images, and these new high quality images will be used where appropriate. Also available are high resolution scans of NIMBUS High Resolution Infra-Red (HRIR) negatives, available here, and these will also be included. 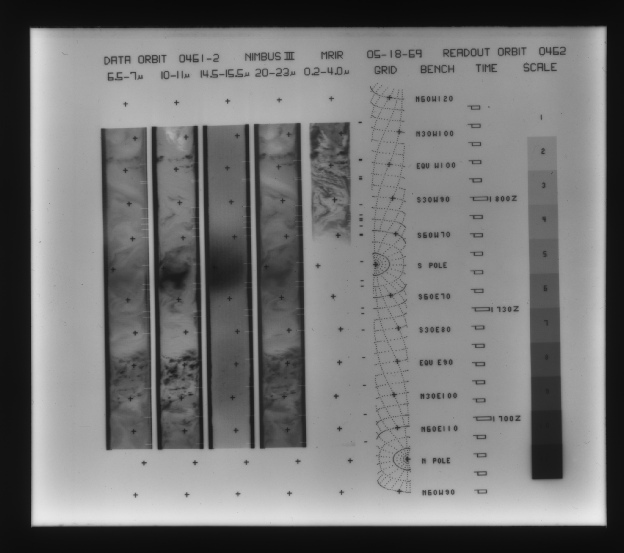 Figure 4.2.00a below shows an example of one of these negatives. The same source also has scans from the ‘Medium Resolution Infra Red’ (MRIR) instrument - see figure 4.2.00b. The quality is not as good as the HRIR version, so I won’t use these unless they capture something the HRIR image has missed thanks to, eg instrument failure. ESSA, ATS and NIMBUS images will be used for each image wherever possible as a demonstration that three different satellites on different orbits show the same weather patterns as the Apollo images. This publication from 1973 has strips from ATS-3 images that cover the Caribbean on the 23rd of May that can be assembled into a single image for that day, and I’ll add those as well to the ‘At the moon’ section’. Images selected for examination are chosen to be representative of the mission and to show different parts of the Earth's surface featuring the same weather systems. In most cases, only the northern hemisphere of ESSA images are used, as relatively little of the southern hemisphere is visible in most cases. Screenshots from the videos and TV broadcasts will also be examined. As an example of the NIMBUS data being freely available, this study contains several examples of NIMBUS tiles used to illustrate the other uses to which the satellite could be put. Let’s see how these satellite images compare with the Apollo ones!